I find myself with more time to myself here living in the country. Probably due to many factors such as A) hubby’s job isn’t a constant pressure (he still has to work here but he doesn’t have to drive anywhere while staying here), B) we have less stuff so less stuff to take care of, and C) I can send the kids outside to play and they actually want to because there is an entire field to run around and explore. One of my favorite things to do is check out the local second hand stores. Many times there is simply a ton of junk, but if you can weed through it, you just might find yourself a treasure. Here were my clever finds. 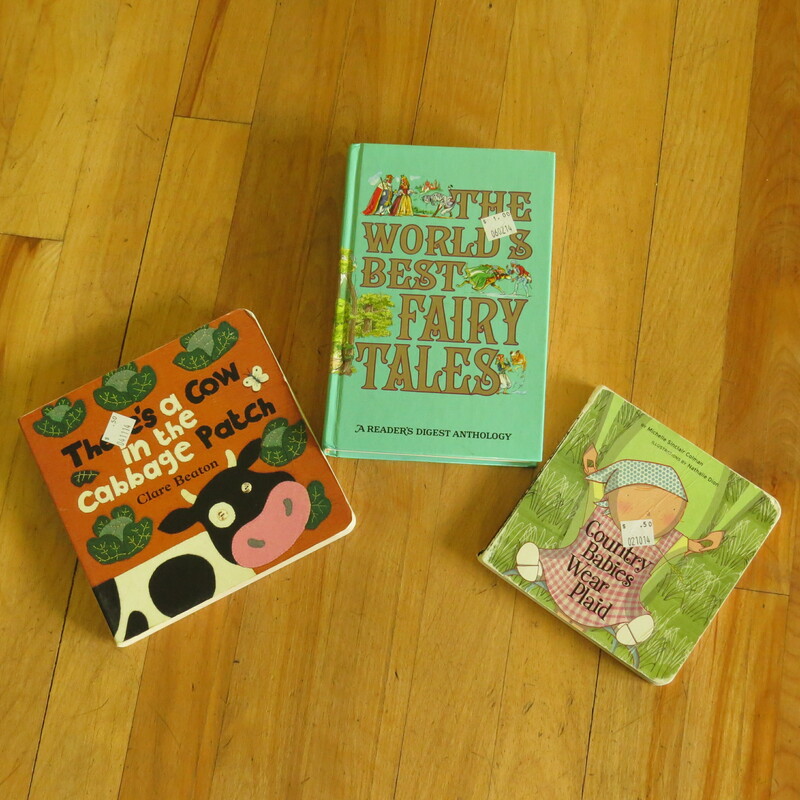 There is a Cow in the Cabbage Patch and Country Babies Wear Plaid were each $0.50. Seemed totally appropriate for the farm. For only a $1 I picked up a hard backed The Worlds Best Fairy Tales. 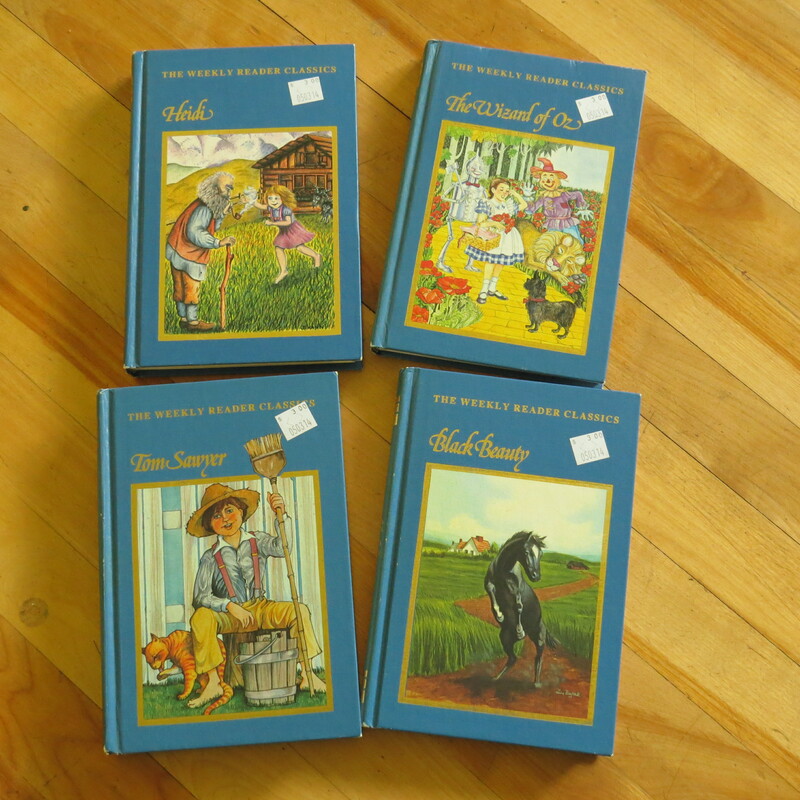 For $3 each I picked up what appears to be never been read hard back classic reads like Heidi, The Wizard of Oz, Tom Sawyer and Black Sheep. What a steal! My (almost) homeschooling heart leapt for joy seeing these! It looks as though these were published in the early 80’s. In fact Music Man remembers reading these exact books. Does that officially make these vintage? Wait, more importantly does this make us old??!! Why don’t we just focus on my brilliant finds instead of my age, mmmmkay?